(Nanowerk News) Researchers from Leiden University and FOM designed a novel metamaterial that buckles on demand. Small structural variations in the material single out regions that buckle selectively under external stress, whereas other regions remain unchanged. The research is published in this week's Early Edition of the Proceedings of the National Academy of Sciences ("Selective buckling via states of self-stress in topological metamaterials"). The promise of metamaterials is to realize artificial structures with unusual properties that would be hard to come by in nature. Their unconventional properties can be programmed by suitable design of their geometry or topology. 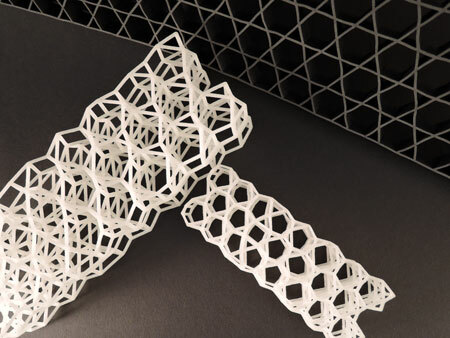 The Leiden researchers created a 3D-printed working prototype of a novel metamaterial that displays selective and tunable buckling. This research was funded by FOM and the Delta Institute for Theoretical Physics. The research was done in the Topological Mechanics Lab (Leiden), led by FOM workgroup leader Vincenzo Vitelli. The lab is fully dedicated to study the mechanical analogues of so-called topological insulators, a recently discovered exotic quantum state of matter. When applied to macroscopic structures, the topological ideas underlying these exotic states give rise to materials with unusual mechanical properties. "The design begins with a general idea, a physical 'hunch', based on this analogy", explains co-author Jayson Paulose. "The major strength of using these topological ideas in metamaterials design is that a topological material is guaranteed to have interesting behaviour at the boundaries." Metamaterials are artificial structures whose unconventional response can be programmed by suitable design of their geometry or topology. We demonstrate a novel metamaterial in which small structural variations single out a region that buckles selectively under external stresses. This prototype is an example of a topological metamaterial, whose response is robust against structural perturbations in analogy with topologically protected electronic systems. The next step is to predict the response of the mechanical analogue with the imposed topological design. The ultimate test is to build it and investigate what happens under various kinds of external stress. That resulted in a flexible plastic prototype that displayed the localized buckling response the researchers were looking for. Jayson Paulose: "We were expecting some trial and error before getting the design to work. But the first batch that we got back from the 3D printing firm worked right out of the box." Selective buckling materials have a wide range of potential applications in engineering and medicine. The buckling behaviour can be tuned without changing other physical properties such as electromagnetic or heat conduction. A typical application would be in shape-memory materials, in which shape-transitions usually take place when the temperature is changed. Selective buckling regions in such materials would show dramatically different shape transitions from the rest of the structure, without affecting the heat flow, giving engineers an new possibility to tune such devices.